UPDATE: Version 02B has been released and it fixes most of the problems. I don’t know if i should post this or not, but as i think i should review almost everything that comes out, i will do it. 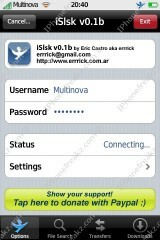 Islsk 1.0b is the first native P2P iphone/ipod native Soulseek client. Although it’s still in beta, it does work pretty well. I’ve been trying to get this client to work for the last 2 hours so I must warn you that for a lot of people this app doesn’t work standard out of the box, you will need to do some ssh’ing and hacking to your iPhone. But i’ll guide you the whole way. 1) You can locate and find the app in your installer. 2) Let’s run the app and have a look. After this you will be asked to enter your account or create one. 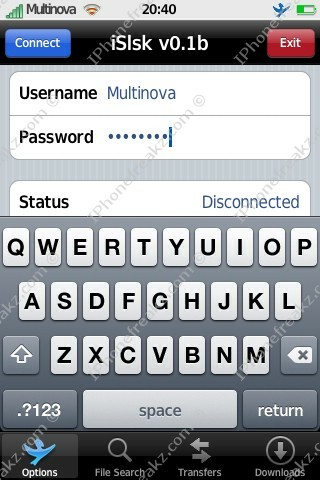 Just entering a username and password will automatically create a account for you. 3) Let’s go search a song. Tap the file search button. Enter a song that you’d like to have and wait for the list to populate. Chose a song and then you can watch the Transfer. After your transfer has completed, you can go to downloads and move the song to your iPod music partition. However most of you will receive a big error message !! Your Firewire GUID couldn’t be recognized and therefore music importing will not be available. To solve this issue, you will need to do some hacking. To learn how to connect to your iPhone and or iPod touch see this post. EXTRA STEPS TO EXECUTE IN PUTTY !! IT SEEMS THAT SOME PEOPLE ARE STILL HAVING ISSUES !! IF you still can’t get it to work i suggest waiting for the next release. Bugfix when trying to import songs, where some of them werent imported and when trying again they appeared twice on music library. Added a donation reminder so nobody forgets about supporting iSlskÂ Â ! When first installed, downloaded songs *may* not appear on your downoads section. Once I restarted iSlsk, everything went fine, and downloads were there. Give me some more time to see why does this happens. Thanks to the original creator Errrick who’s website you can consult here. 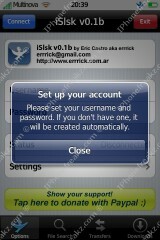 This little app is available in the Installer.app through the BigBoss packaging source, see our sources page. it doesnt show my downloaded song! yeah i did everything it says a hundred times except restoring or updating to 1.1.4 and download a hundred songs as well so im over it and ill wait it out. and i didnt get the songs to show up in downloads tab. any help would be cool. turned phone off and on too. hey dude thank you for the link, made me happy but when i tried to install it gave main script execution failes! what wrong with that? hey multinova i ried ur tutorial but didnt work dude, i dony know why. i did exactly what u explained but couldnt fix it, suppose will wait until erric put something ot. “Firewire GUID Patch for iSlsk 0.2.2” allowed me to access the section of iSlsk without the error prompt, though causes the app to crash every time i attempt an import irregardless of how it’s done… YMMV. the application doesnt work it gives you new errors, the import is not possible, i think the Isisk app is not designed properly thats why its not compatible with iphone/ipods. Please don’t install the patch.. it doesn’t do all the steps needed to get the app working. If you follow the steps above, it will work. you must type it exactly as it is . hello guys, i finaly got this program through ziphone and am also getting this error messege, unfortunitly NONE of those steps above make ANY sence to me. Is there ANY kind soul willing to help me and walk me through the steps? PLEASE? How do i fix the import thing and how do i find the song that i download? What i have to do in this part? great job!thank you for the support,works great now! the link doesn’t seem to be working. Keeps timing out. ok, now not only does the avplayer i downloaded not ever work, but now somethings is wrong with my ipod player. i downloaded something last night and ever since i imported the song, the ipod on my iphone doesnt even load. all i get is a white screen and then it jumps back to the main screen…can anyone help please? oh, and i was using the islsk to download the song. not sure if it was islsk or the file i downloaded that caused it. Thanks Erric for the awesome download!!!!!! This is a well known issue, no fix available yet. If you download music, you should copy it to your local machine before importing it in itunes. i copied wrong commands and pasted onto the putty, what should i do ?? will it effect to the iphone’s system ?? How can i earse it ? Hi. I have my iPhone originally sync-ed to an iBook, however, I already have sold it out. Since all of my music are in there, I have not added any songs in my iPhone for months now. And learning about iSlsk is great. I have tried downloading stuff over wi-fi but it doesn’t appear in my iPhone. Then I learned that i need to resync it to my iTunes. Problem is I don’t think I have set it to manually manage my music library. I am using a Sony Vaio now. QUESTION: Will this automatically delete all my music in my iPhone when I try and re-sync it to my new laptop? Will it show all the music that I have downloaded using iSlsk? Help! i’m not sure this is the right app i’m looking for. what i need is sometimes to copy some songs from a pc at the office, while my itunes’ sync is at home. i’d like to have these songs ready to hear immediately on my iphone. then i’d like to add it to my itunes lib/sync when i get home. im not sure about something… i havent gone through every question so im not sure if someones already asked this. i was wondering if a song was not on islsk can i put it from my computer into islsk so i dont have to use itunes ( i hate itunes) any help would be great… practically the same question toto asked just im not at my offise :-p thanks for the help. How do i download this onto my ipod in the first place? I love everything about this site!! 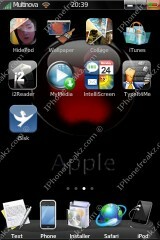 I have tried downloading stuff over wi-fi but it doesnâ€™t appear in my iPhone. Then I Fashion and Vintage learned that i need to resync it to my iTunes. Thanks for sharing with us.